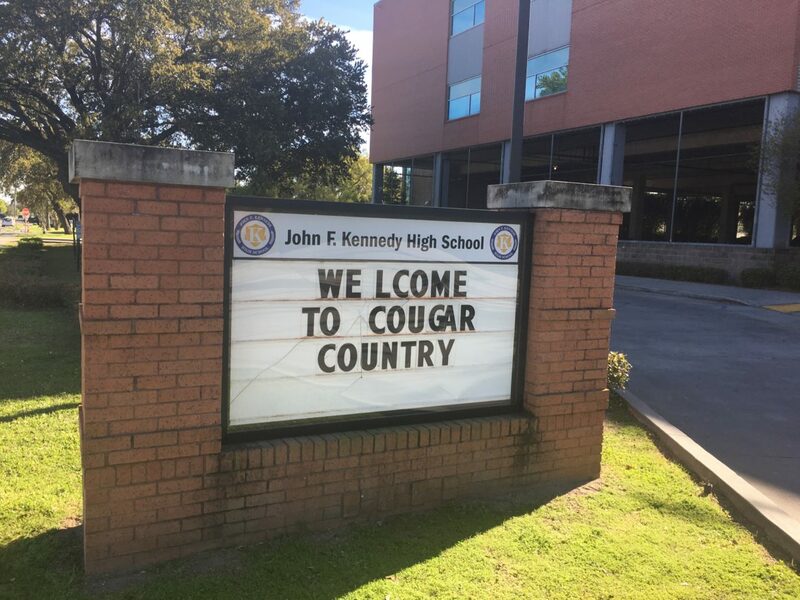 John F. Kennedy High School at Lake Area on Paris Avenue in Gentilly. A former administrator at a New Orleans charter school network suspects that John F. Kennedy High School employees changed students’ final letter grades from F’s to D’s and D’s to C’s in an attempt to give students credits they didn’t earn. At least 17 students in Algebra III moved from an F to a D, according to the employee, Runell King. King worked as the director of data, assessment and accountability for the New Beginnings Schools Foundation, which runs Kennedy. He told The Lens that he discovered the irregularities while reviewing records with an employee at the high school. King alerted New Beginnings last month in a letter. Shortly after, he was suspended and has since been fired, which King claimed resulted from his letter. “I was basically fired for blaming JFK’s administration for manually modifying grades,” he said. In an interview with The Lens, New Beginnings CEO Michelle Blouin-Williams disputed King’s claims about the charter high school, as well as the reasons he was fired. The Orleans Parish school district likewise told The Lens it conducted an investigation and found nothing improper. But The Lens obtained screen shots of a gradebook for the algebra class. Small red exclamation marks appear next to several students’ grades. That is the symbol for a manual override. The Lens asked Blouin-Williams about the gradebook. She denied that any grades were changed manually. “What I can reassure you about is that our internal investigation, as well as [the Orleans Parish school district] investigation, into this matter, found no evidence that anyone manually changed grades in the system,” she said. The Lens then provided one of the screen shots to Blouin-Williams. She did not respond. This week on Behind The Lens, before Lt. Gen. Russel Honore retired from the U.S. Army, he commanded Joint Task Force Katrina, leading post-Katrina recovery efforts in the Gulf Coast. Now, Honore leads GreenARMY, a coalition of groups promoting environmental issues across Louisiana. We asked him this week to discuss his group’s priorities for the Louisiana legislature’s 2019 session. He offered an overview of pollution and environmental quality issues in our state. The U.S. Environmental Protection Agency has asked Mosaic Fertilizer to resume removing wastewater from its reservoir atop its Gypsum Stack No. 4 in St. James Parish, despite the company reaching its objective of lowering that water below an elevation of 180 feet. But Mosaic told The Lens that the company has not decided to do so — even as the EPA cast doubt on the company’s model used to determine the stability of the reservoir itself. Mosaic, the EPA and Louisiana’s Department of Environmental Quality have been in emergency mode since Jan. 10, when the company first alerted the agencies to a bulge in some farmland neighboring the northern slope of the 200-ft-tall gypsum stack, which at the time held roughly 750 million gallons of highly acidic wastewater left over from production processes at the plant. It indicated shifting in the layers of soil beneath the stack and raised the possibility that the northern wall of the gypsum dam could breach. The company had been removing much of that water from the top of Stack No. 4, with the aim of lowering the water level’s elevation, easing the weight of the water stored and reducing the chance that a wall breach could pour much of the wastewater into nearby waterways, including the Blind River. Columnist Roberta Brandes Gratz thinks the RTA’s pilot plan to eliminate stops and close intersections along the Canal streetcar line will cause more problems than it solves. “RTA calls it a ‘pilot’ program that will last six months, but ‘pilots’ have a way of becoming permanent and spreading to other streetcar lines. Ironically, the author of this proposal is the very company, Transdev, whose contract, already subject to an overhaul, may not be renewed when it expires in August. The proposal provides good reasons to question Transdev’s leadership and vision. “The proposed pilot program to improve Canal streetcar performance is kicking up a lot of online pushback. In my view, the critics are shortsighted. Parents anxiously await New Orleans’ enrollment lottery results from the time they submit applications in late February to mid-April, when the mysterious algorithm that controls every child’s school placement spits out answers. “It doesn’t allow for hopes to be brought about in a timely way,” parent Alex Lafargue said.